The whiskers and eyes of this colorful cat mark the hours. 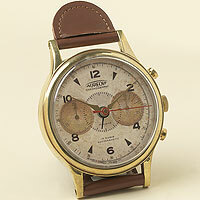 This reproduction of a 1940s timepiece evokes a time when classic looks and lifetime functionality were the norm. Brass and brown leather with second sweep hand and alarm. Takes one AA battery (not included). 4 3/4"h. x 3 1/4"w. x 3 3/4"d.
It's summer - so it's time to wake up your wardrobe a little (or a lot, as may be the case with this bright yellow watch). The multicolored face of this quartz watch from designer Gene Meyer is a marriage of old and new design. The slim silver body fits conveniently in a pocket. A chain is included for the loop at the head of the watch. Powered by batteries, included. Chain comes in a preforated tin case. In Sebastian Wong's Font Clock, 12 typefaces cycle through time. The fonts were chosen for their design strength and individuality - 11 are from the 20th century and one is an English 18th Century script. 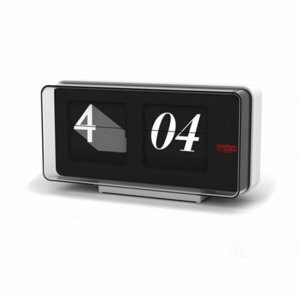 Completely automatic, self-adjusting digital clock. Battery operated. 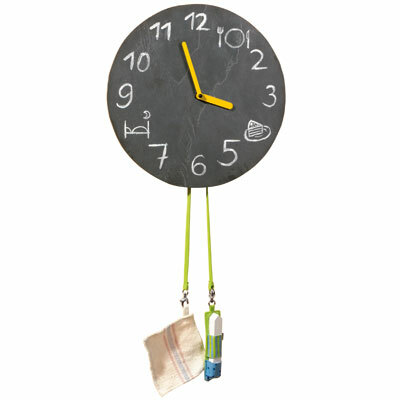 Like a chalkboard, numbers or symbols may be written on the clock face. This wall clock can be changed however you like. Help your children become familiar with the time of day and the daily schedule. A piece of chalk and a wiping cloth hang like "pendulums" ready for use. Functioning wall clock with clock face made of slate on birch. Requires 1 AA battery, not included. Timex's iControl watch lets you operate your iPod from your sport watch - no more fidgeting with the iPod buttons in the middle of a run. 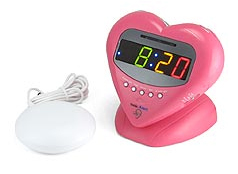 The Sonic Boom Love Clock has an adjustable volume alarm with a maximum loudness of 113 decibels (just for reference, a jackhammer is about 100 decibels!) And the bed shaker attachment does just what you think it would. Slip it under your mattress and your ears will bleed and your bed will shake, and there is no way you will oversleep and miss your date with romance. And...if you ever get a real date (or just need a massage) you can turn off the audible alarm and just let the bed shaker do its thing. 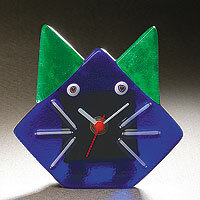 Stroke of Art finds interesting objects in flea markets and transforms them into functional jewelry, clocks and art. This 1950's twin lens camera with clock runs on a single AA battery. The strap can be used to hang on wall! After a deadly train wreck in 1891 was blamed on an engineer’s watch that had stopped for four minutes, the American Railroad Association created stringent standards for a new type of railroad-grade watch. This Conductor’s Pocket Watch is an updated tribute, with a chunky 2" stainless steel case that has the satisfying size and heft of those watches from the 1890’s. 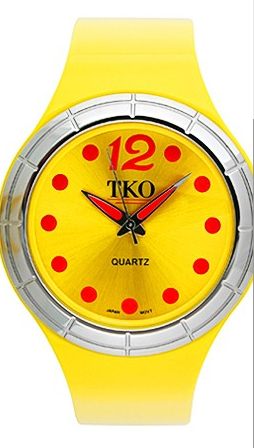 Super-reliable Japanese quartz movement may keep you from a few train wrecks of your own. 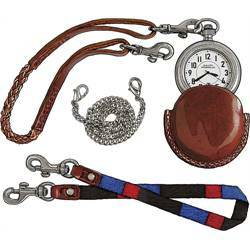 Comes with protective leather case and interchangeable 15" leather, nylon and chain-link tethers. Imported.